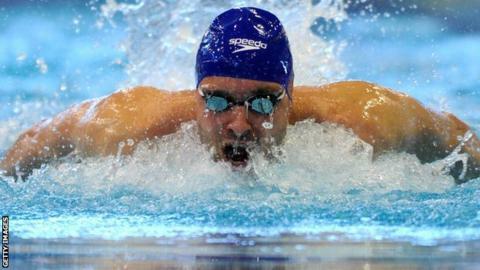 James Goddard came second in the final of the 200m individual medley on day three of the European Championships. The Commonwealth champion, 29, led at the halfway stage in Debrecen, but was pegged back then overtaken by Olympic silver medallist Laszlo Cseh. The British swimmer finished in 1min 57.84secs, 1.18secs behind Cseh. Goddard has opted to compete only in the 200m medley at the London Olympics, rather than combining with the 200m backstroke as at Beijing in 2008. The Hungarian beat him to World Championship bronze in July 2011 and the two are set to renew their rivalry in London, where they are likely to face formidable opponents Michael Phelps and Ryan Lochte. Elsewhere, Robbie Renwick finished eighth in the 200m freestyle. The race was won by home favourite and world record holder Paul Biedermann, the German adding the gold to the 400m title he claimed earlier in the week. Michael Jamieson failed to make it through to the final of the 200m breaststroke, although there was better news for Sophie Allen, who was the fifth-fastest qualifier in the 200m individual medley.